An exhibition in the United States showcasing Chinese landscape art, or shanshui, is giving American viewers a taste of of traditional Chinese ink painting blended with contemporary experimental art. The three-month exhibition, opened on Thursday and will be on view through June 9 at the Lyman Allyn Art Museum in Connecticut. At the event, 11 contemporary Chinese artists, some based in New York and some in China, including Wu Yi, Gu Wenda, Xu Bing, Zhang Hongtu, Wang Mansheng, Zheng Lianjie, Cui Fei, Guo Zhen, Mao Xiaojian, Wang Ai, and Cai Dongdong, are showcaing their approaches to Chinese landscape art. “The works come in different styles and media including ink painting, oil painting, photography, installation, performance, and video art,” says Huang Yibing, the exhibition planner, who is himself a Chinese poet known by his penname Mai Mang. Huang is an associate professor of Chinese at Connecticut College and also serves as the curator of the school’s Chu–Griffis Asian Art Collection. Huang received his BA, MA and PhD in Chinese literature from Peking University in the 1980s and 90s and moved to the US in 1993, where he earned a second PhD at UCLA. He has published poetry and books about contemporary Chinese literature, besides articles on and translations of contemporary Chinese poetry in English language journals, introducing modern Chinese poetry to Western audiences. In 2011 he guest-edited “The China Issue” for the Hong Kong based English language online journal Cha, introducing contemporary Chinese poetry and art. And in 2012 he won the 20th Rou Gang Poetry Prize in China. Speaking about the exhibition, Huang says that the artists and artworks are innovative each in their own right and shed further light on a wide range of themes, including landscape traditions in the East and West. 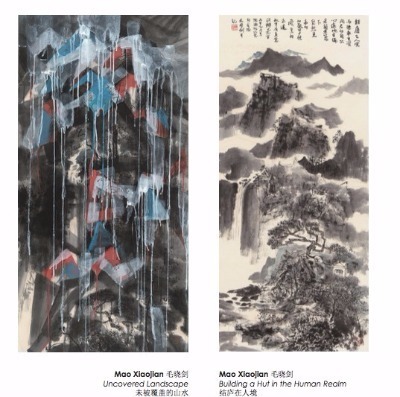 For example, two pieces by Wu Yi, one of the exhibited artists, depict landscapes in China and in upstate New York respectively, presenting an unceasing quest for origins and purposes beyond borders, and demonstrating his masterly, energetic and assertive, and highly personalized brushwork, Huang said.